You don't need to wait for your seedlings to grow up to take care of themselves with this self-watering kit. You don't need to wait for your seedlings to grow up to take care of themselves with this self-watering kit by Sarah Burrows and Nick Behr. The idea for this system grew from the makers' struggle to sustain a kitchen garden in their fourth-floor Chicago apartment. The busy professionals turned to hydroponics for help and were astounded by the results. Designed for space-conscious urbanites, home cooks, and aspiring indoor farmers, each of their kits is outfitted with reusable glass canning jars. The jars are threaded with wicks that pull water into the transplantable coco husk pots, keeping your veggies-to-be hydrated. Once your organic cherry tomato, sugar snap pea, and Thai pepper seeds have sprouted, transfer the seedlings along with their biodegradable pots outside to thrive in your garden. Assembled in Illinois. Click to see Planting Instructions & Tips. 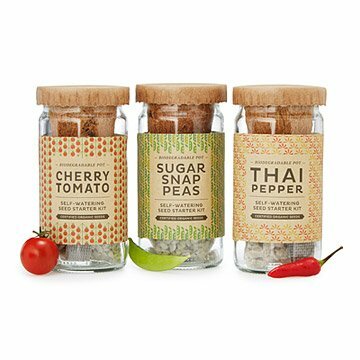 Kit includes cherry tomato, sugar snap peas, and Thai pepper seeds. Great gift and fast delivery! My mom has always loved to grow peppers, but moved and had less space. She also loves to eat tomatoes on everything. I immediately thought of her when I saw this item.